With the summer holidays in our midst, transport yourself to the Aegean with this classic recipe from Lemonia. It can be prepared family-style using a 15” x 10”ovenproof dish, or in smaller dishes for individual portions. Peel the aubergines and courgettes and slice lengthways into ½” slices. Place in a colander, sprinkle over a pinch of salt and allow to rest for 30 minutes to remove bitterness, wiping away any excess moisture with kitchen paper. Thinly slice the potatoes. Heat olive oil in a pan and separately fry the sliced potatoes, aubergine and courgettes, in batches if necessary. Rest the vegetables on kitchen paper or in a colander to drain off any excess oil. In the same oil, briefly sauté the lamb mince. Add the onions and garlic and stir for around 5 minutes on a medium heat. Pour in the wine and stir for a further 2 minutes. Add the tomatoes, herbs and spices, season with salt and pepper to taste and simmer for 30 minutes until the lamb is tender. If the mixtures starts to get a little dry, add some water to the pan. To make the béchamel sauce, melt the butter in a saucepan and, using a wire whisk, mix in the flour over a moderate heat. Continue whisking vigorously until the mixture starts to froth. Remove from the heat and continue whisking whilst adding the cold milk. Return the pan to the heat and slowly add the beaten eggs, whisking constantly to prevent curdling. Season with the nutmeg, salt and white pepper to taste. Remove from the heat, stir in half of the cheese and leave to cool slightly. Preheat the oven to 375°F/170°C. 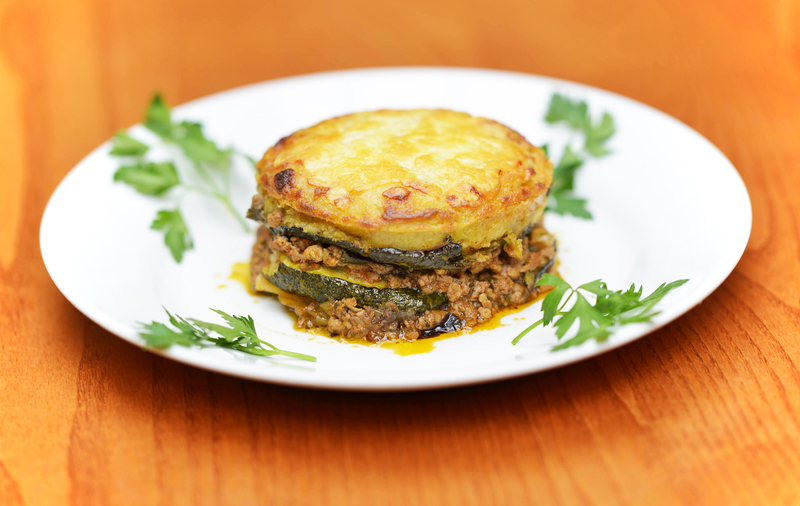 In your dish (or dishes), build single layers of potatoes, then aubergines, then courgettes. Spoon all the meat mixture over the courgettes. If there are any vegetables left, layer them over the meat. Spread the béchamel sauce evenly on top, sprinkle over the remaining cheese and cook for 1 hour. Check after 45 minutes: if the top is starting to brown, cover loosely with foil for the last 15 minutes. Remove from the oven and allow to cool for at least 20 minutes before serving. Previous Previous post: What do you think about the On The Hill magazine?